The signs were right in front of my eyes—a gnawed roll of paper towels and a scattering of black sunflower seed husks. Yet because I hadn’t actually seen or heard anything, I told myself I might be mistaken or that perhaps the responsible rodent had moved on, or better yet, died. Fiddle-de-de. If Paul Ryan and Mitch McConnell can ignore it, so can I. I turned off the basement light and lit out for Key West. I returned a month later and went down to the basement to tend to the plants wintering over in my makeshift greenhouse in front of the west-facing windows and that’s when I knew for sure I had a situation. The black droppings beside the potted gardenia were a dead giveaway. Obviously a mouse had been drinking the water I left in the saucer. And speaking of dead, there was one inside a very large terracotta pot. It must have been walking along the edge, tumbled in, and then couldn’t get out. One thing I knew for certain, though, was where there was one mouse there were three. It was time to kick do-nothing Paul and Mitch to the curb and channel my inner Janet Reno. Yep, I was gonna “go Waco” on these varmints. Today’s choices run the gamete from simple to high tech. Take Victor’s “Multi Kill Electronic Mouse Trap,” for example. It’s a black box with two entry points that looks like a lunch box. The mice go up a special staircase to get the bait and when they get upstairs they’re immediately electrocuted in less than three seconds. After the mouse dies, a chamber automatically rotates and dumps the carcass in a collection drawer hidden from sight. The trap then automatically resets. A light blinks green to indicate a kill. It can hold ten dead mice. Four C batteries included. Despite its diabolic nature, zapper mousetraps are considered humane because they kill quickly. The most humane of all mousetraps, however, are the no-kill, catch and release models. Okay, I understand the sentiment. But, seriously, where are you going to release them and who in their right mind wants to encourage the growth of the rodent population? Although for a moment I thought it might be fun to catch a few and drive them to DC and set them free at Ivanka and Jared’s house in Kalorama, where I’m sure they’d feel right at home…. Poisons are probably the easiest remedy. But then the rodent dies somewhere out of sight and you must endure the odor while you search for the dearly deceased. You can also use plug-in ultrasonic sound repellers to disorient the mice and drive them away. This sounds interesting, but it seems any object around the repeller will block the waves, so you have to know exactly where the mouse is. And what if the mouse merely moves to the other side of the basement? I sensed a scam. In the end, I loaded up on classic spring traps and glue traps because they were cheap and I could trust the premise. Most mice are caught within the first 24 hours of putting out a trap, so it was important that I planned a big first assault. For bait, I created a smorgasbord no rodent could resist. 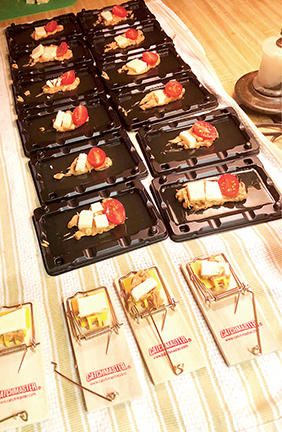 I put a healthy-sized shmear of chunky organic peanut butter on each trap, followed by slices of cherry tomatoes and cubes of sharp English cheddar. The bait cost more than the traps, but it didn’t matter. I was determined to lure the little bastards out of hiding. I placed the sixteen buffet trays and traps all around the basement and waited. And waited. And waited. Nothing happened in the first 48 hours. On the third day the bait disappeared. And the traps had been moved. Something big was down there in my basement. Good lord, not a rat, was all I could think. Mice I could tolerate, but rats! I re-baited the traps. Further research told me my bait was probably too big. The rodent was eating it without getting caught on the trap. This time I used a tiny dollop of peanut butter and a crumble of Danish blue cheese, but omitted the cherry tomato because I thought it was just too much. I moved the traps towards the perimeter of the basement because that’s where they like to travel and I took a Lunesta and went to bed.